Books! A small, but committed, page-turning gang of people LOVE PRINTED BOOKS! The reasons for that love (or the lack thereof) live in each of our cores. There’s no explaining it in any other rational way. Somehow, at some point, us older book lovers each fell in a kind of love with a character, a genre, a subject area, an author or an illustrator. But few realized that they also fell in love with the physical medium itself—its heft, texture and aroma. Physical books were all we had, of course. Paper and ink. Nowadays, children and young adults have so many more “reading” choices in terms of medium than we did back in the dark ages. Take digital or e-books, for example. I love e-books because they are easy to read in the dark (in bed, on a plane, in the back seat of a car) and I can get them on my smartphone and tablet, as well as my computer. They take up virtually no space in my home. They are usually less expensive than their printed counterparts. I can change the font in several ways, and when I put down the book I’ve been reading on my phone, in a few days when I find myself with my tablet, I can open the book to the place I left off only a few days before on another device. Too cool! I also very much enjoy audiobooks. I came to appreciate a-books during long commutes and road trips (first on tape, then on CD, now on line). The wonderful voices of talented actors and those with unique vocal qualities make the miles go by and the otherwise boring time pass enjoyably. More often than not, upon arriving at my destination, I have remained seated until the chapter was over before leaving the confines of my vehicle. 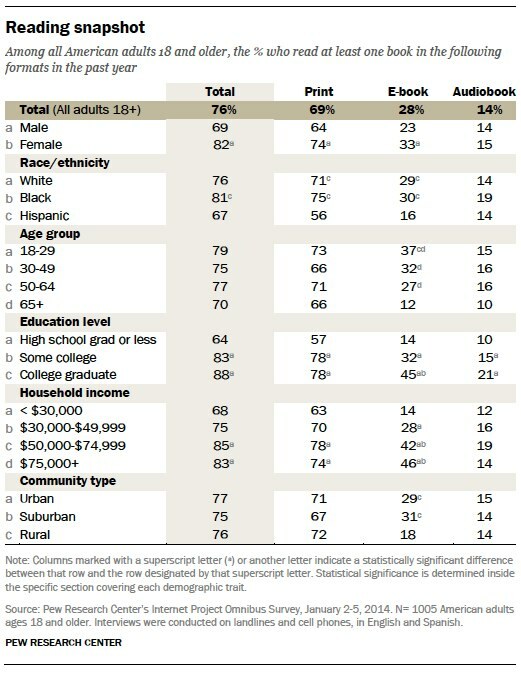 People also have many choices about how to acquire a good read (or listen). They can get books in traditional ways, like by visiting a library or bookstore. They also can browse the Web or order a book to be delivered by mail. So, how are we handling this interesting range of engaging literary works? The statistics shown above about the number of books read by various groups reveal that, in general, we are a society of readers, though in most cases probably not avid readers. This is so, I believe, because avid readers are not born, but rather are taught to be so. They are steady, lifelong learners reliant on books for new information and novel experiences, especially when such content is available to them in ever more convenient media. What’s interesting is that though avid readership can sprout at any time of life, schools seem to be turning out fewer and fewer young avid readers. Maybe it’s the media of the books kids find in the school library that is the hitch these days. For younger generations, perhaps paper and ink feel a bit old-fashioned. As for lucky, more mature, avid readers like me, it really doesn’t matter what the back is made of. Hardback, paperback, a-back or e-back. What matters is the ease of accessibility that a book format creates for delicious, engaging reading when and where we like. ← The Biggest Question is WHY?